PSALMS 104:24 KJV "O LORD, how manifold are thy works! in wisdom hast thou made them all: the earth is full of thy riches." 21The young lions roar after their prey, and seek their meat from God. 22The sun ariseth, they gather themselves together, and lay them down in their dens. 23Man goeth forth unto his work and to his labour until the evening. 24O LORD, how manifold are thy works! in wisdom hast thou made them all: the earth is full of thy riches. 25So is this great and wide sea, wherein are things creeping innumerable, both small and great beasts. 26There go the ships: there is that leviathan, whom thou hast made to play therein. 27These wait all upon thee; that thou mayest give them their meat in due season. O Lord, how manifold are thy workes! in wisedome hast thou made them all: the earth is full of thy riches. O Lord, how great is the number of your works! in wisdom you have made them all; the earth is full of the things you have made. 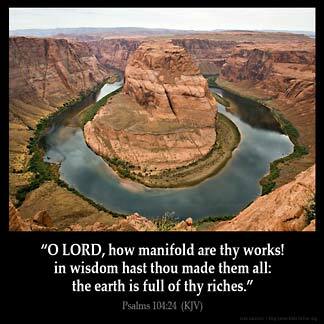 How manifold are Thy works, O LORD! In wisdom hast Thou made them all; the earth is full of Thy creatures. God is in His Great and Majestic wisdom is so powerful and at the same time merciful. I look back at the time there was a great snowfall and when I stepped outside. It was so peaceful : Man had not gotten out and dirtied it up yet. Then the Lord spoke to me : The work of righteousness shall be peace and the effect of righteousness shall be quietness and assurance forever. My people shall dwell in peaceable habitations and sure dwellings. Praise God for His wonderful works to His children.